Whether you want to travel, communicate with friends or colleagues, reconnect with family, or just understand more of what’s going on in the world around you, learning Finnish will expand your horizons and immeasurably enrich your life. In the final 10 lessons, you’ll be speaking and understanding at an intermediate level. In this phase, more directions are given in the Finnish language, which moves your learning to a whole new plane. Lessons include shopping, visiting friends, going to a restaurant, plans for the evening, car trips, and talking about family. You’ll be able to speak comfortably about things that happened in the past and make plans for the future. 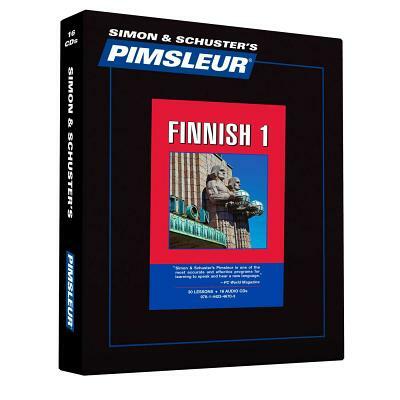 Reading Lessons begin in Lesson 11 to provide you with an introduction to reading Finnish. These lessons, which total about one hour, are designed to teach you to sound out words with Finnish pronunciation and accent. A Reading Booklet to be used with the audio lessons is also included in PDF format. Finnish belongs to the Finnic branch of the Finno-Ugric family of languages. Its closest relative is Estonian; Hungarian is a distant cousin. It is spoken by approximately 5.2 million people, mostly in Finland, and by some in Sweden and Russia as well. There are three varieties of standard Finnish which are spoken throughout the country: kirjakieli ("book language") - used in official documents, official speeches and the daily news; yleiskieli - the standard language used in schools; it is formal and correct, though more relaxed than the "book language," and puhekieli ("spoken language") - more casual variety used in everyday conversation, which changes frequently. This course teaches the standard Finnish language, yleiskieli. Dr. Paul Pimsleur devoted his life to language teaching and testing and was one of the world’s leading experts in applied linguistics. After years of experience and research, Dr. Pimsleur developed The Pimsleur Method based on two key principles: the Principle of Anticipation and a scientific principle of memory training that he called “Graduated Interval Recall.” This Method has been applied to the many levels and languages of the Pimsleur Programs.